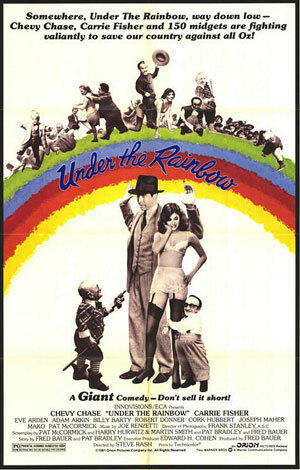 Because, while Under the Rainbow is chock to the gills with uncomfortable levels of racism, sizeism and general bad taste that probably should have raised an eyebrow back then, let alone now…. you can’t say it’s predictable formula. To whit: Depression Era Kansas, where a midget named Rollo is eagerly awaiting the news that Hollywood Wants Him. After almost killing himself falling off a barn fixing the radio antenna, he gets word that, in fact, Hollywood does want him. Or, at least, midgets and dwarves in general, since the casting call for a little picture named “The Wizard of Oz” has gone out. So Rollo is off to Hollywood. BUT also on his way to Hollywood is a German Spy, since the Nazis are on the move! This spy? Also a midget, played by the always reliable Billy Barty. He’s supposed to meet a Japanese agent in Hollywood, and give him a secret America-invading map. This is a crucial point that really gets glossed over: The Nazis already have a secret America-invading map. BUT also on their way to Hollywood is a paranoid Duke and his half-blind wife, under the protection of Secret Service agent Chevy Chase. The Duke is convinced someone is trying to assassinate him. And that’s because someone is, but for a while Chevy doesn’t believe that. BUT due to some sort of mix-up involving a secretary not doing her job, hotel reservations aren’t made properly, and the end result is poor Carrie Fisher is the poor movie studio lackey tasked with finding a place to put 150 midgets and dwarves. She shoves them all into a hotel, which is the same one as the Duke and Duchess, as well as the German Spy and his Japanese counterpart. Oh, and a tour group of Japanese photographers. See, there’s the joke: the German and Japanese spy were su pposed to have an easy time finding each other, since they’re looking for a midget and a Japanese man in a white suit with a camera, respectively. Which, normally, would be things that stand out in a crowd, except the crowd is nothing but midgets and Japanese men in white suits with cameras. 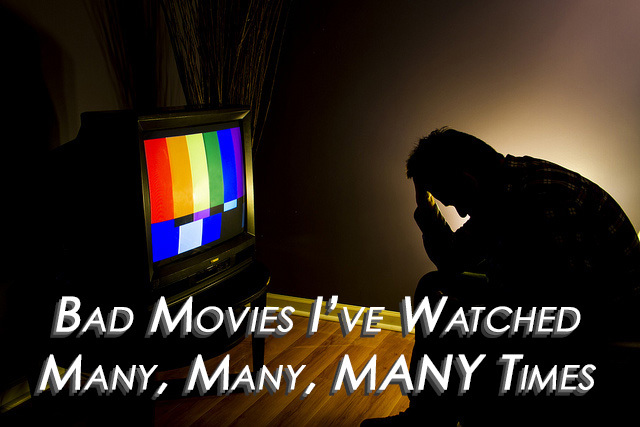 And a Duke and Duchess, Chevy Chase, a series of suicidal dogs, a beleaguered Adam Arkin as the assistant hotel manager (desperate to prove his worth to his father), and Carrie Fisher in her period appropriate underwear. That’s a lot of story balls in the air, people. This movie is 97 minutes long and it uses them all. Not well, mind you. But it’s always got stuff happening. Batshit is better than boring. A big problem is the movie doesn’t commit to who the hero is. It kind of wants it to be Rollo (Remember him? Way up at the beginning of all this? ), but it second guesses having him be the center of the movie, so it sticks Chevy Chase’s Secret Service Agent in the mix to do the real Hero Work. But it keeps Rollo in orbit of Chevy, probably because when it comes time for someone to throw down with Nazi Billy Barty, if Chevy Chase did it, it’d just be weird. 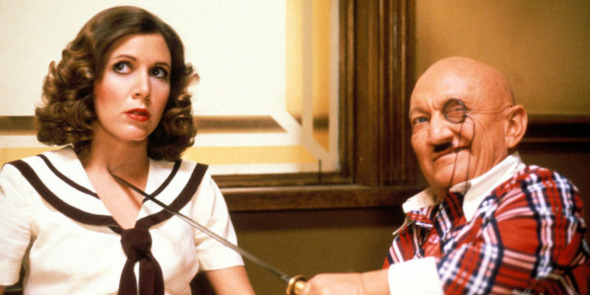 So, while Chevy and Adam Arkin are mostly just replacing the Duchess’s dog (they keep dying, but she’s too blind to actually tell the constantly replaced lineage of dogs apart), Nazi Billy Barty gives the map to the wrong Japanese man, who is then accidentally killed by the Duke’s incompetent assassin, but not before he leaves the map in Carrie Fisher’s copy of the Wizard of Oz script. So Nazi Billy Barty, of course, holds her at swordpoint, takes the script and her dress, and leaves her locked in the freezer. You think I’m kidding about Carrie Fisher in her period-appropriate underwear, but it’s a prominent aspect of this movie. The poster for the movie features her in her underwear, front and center, as if that’s just how she is the whole movie. It isn’t. It’s just for this dramatic action centerpiece where she waits in the freezer with Rollo until Chevy rescues her. Things come to a head as the assassin confronts the Duke and the real Japanese spy kills him, but Nazi Billy Barty escapes with the map, and Rollo chases him on a wagon… but then the wagon crashes. And Rollo wakes up, having just fallen off the barn from the beginning of the movie, and it was all just a dream. Chevy and Carrie and Adam Arkin and the Duke and Duchess and even the Japanese spy are all amongst the Depression-Era hobos living in the barn. But the radio really does work, and there really is a casting calling for Rollo in Hollywood. He gets on the bus, and the driver is: Non-Nazi Billy Barty! No, but it was our collective nightmare. Despite that, I know I saw it many, many… well, you know.